Join genomics.entrepreneurship@UBC and TerreWEB in this year-end showcase to celebrate our speakers’ passion for their research in this Powered by Pecha Kucha night. 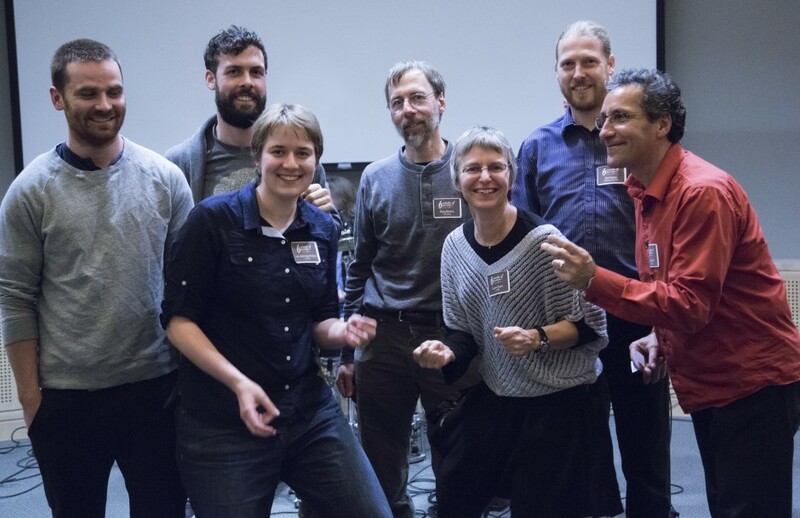 The idea behind this event is to have a fun and inspirational evening with some good food, drinks and music, and to mingle with people outside of the lab and the usual conference-style academic format. Pecha Kucha, or Japanese for “chit chat,” is a presentation style in which each presenter gets 20 slides for 20 seconds each slide, so the whole presentation is just over 6 minutes. This format is highly visual and incorporates more story-telling elements than a typical PowerPoint presentation. Pecha Kucha Night was first started in Tokyo and is now used in hundreds of cities all over the world, including Vancouver. 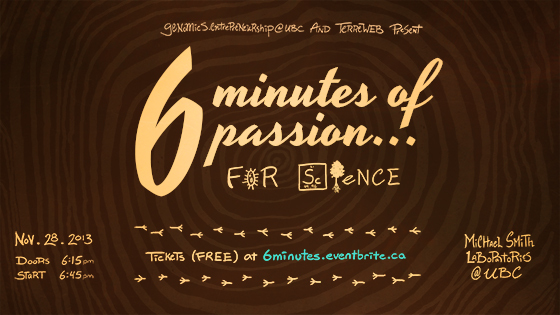 6 Minutes of Passion…for Science incorporates this style, with a focus on science and creativity. Our speakers will talk about their passion for their research and what motivates them to do what they do. Find out more about the presenters at our Speakers page. We are excited to present some local talent – Snowman in Heat – who will kick off the night! Thursday, November 28th Doors open at 6:15 p.m. Event starts at 7:00 p.m.
genomics.entrepreneurship@UBC would like to thank the following people for their help in making 6 Minutes of Passion…for Science a smashing success! Snowman in Heat for providing the fun and energizing the audience, as well as for the science-themed version of “Hallelujah”! View the photos from the event in our 6 Minutes of Passion…for Science Photo Gallery. Photos by Xelha Tapia of Xelha Event Photography. Videos from the night are now online. Watch them below. genomics.entrepreneurship@UBC is a Genome BC and Genome Canada program which aims to address the unique entrepreneurial challenges associated with the uptake of genomics research in natural resource management. Overcoming these hurdles could contribute significantly to environmental sustainability and the ongoing success of Canada’s natural resource sector as it adapts to the changing global economy and climate. TerreWEB ((Terrestrial Research on Ecosystem & World-wide Education and Broadcast) is a NSERC CREATE program dedicated to create an enriched, innovative, collaborative graduate training environment that addresses key scientific gaps in understanding the impacts of global change on terrestrial ecosystems and developing strategies for mitigation and adaptation, and evaluating the factors underlying global change communication deficits, developing novel communication strategies for addressing these deficits, and measuring the efficacy of those strategies.